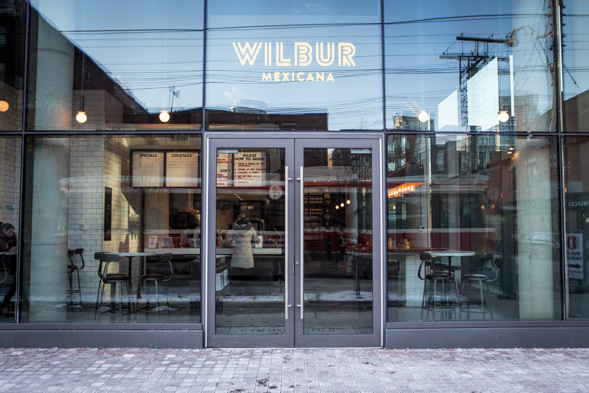 Wilbur Mexicana is a taco joint on King West named after Wilbur Scoville, the chemist responsible for creating the Scoville scale, the measure of heat used to gauge the pungency of chili peppers. 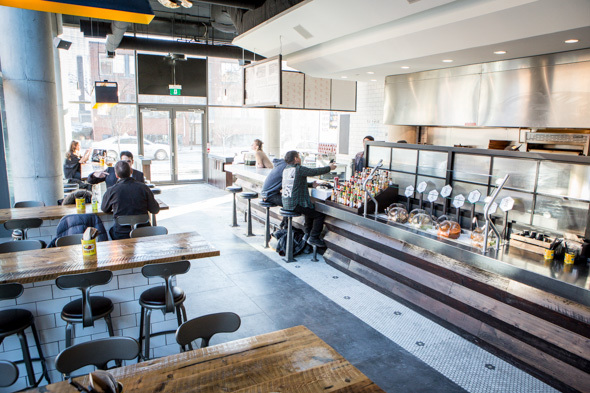 Co-owners Will and Baird Cumberland (a pair of brothers) and Steve Chan have introduced a casual eatery devoted to quick service, but still cool enough that you might want to linger over beers with friends. The decor draws on Scoville's career in laboratories rather than a Mexican theme. The 60-seat space offers a mix of furnishings, including high countertops with stools and vintage-looking tufted leather banquettes. 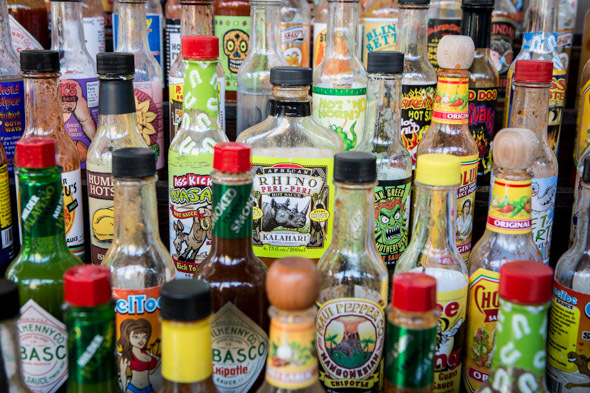 Decorative flourishes include an apothecary cabinet stocked with dried and preserved chilis, while beakers are repurposed into light fixtures and artworks by local artist Justin Broadbent illustrate how different peppers stack up on the Scoville scale. 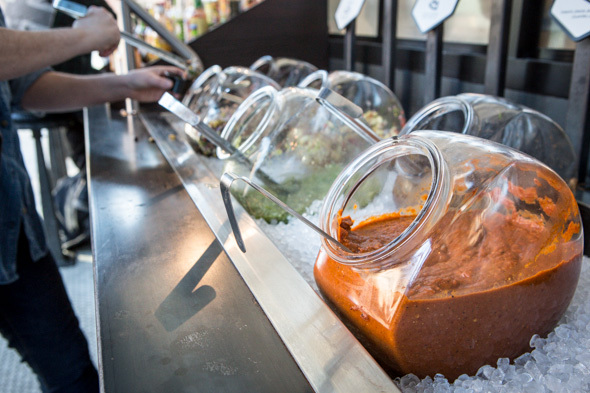 The open kitchen instills confidence as I can see all the fresh salsas being prepped fresh and tossed by hand while the salsa bar, featuring 60 or so different hot sauces, are an intriguing feature that encourages diners to do a little experimenting of their own. Diners can expect to wait no more than five minutes in line, then five minutes for their food. 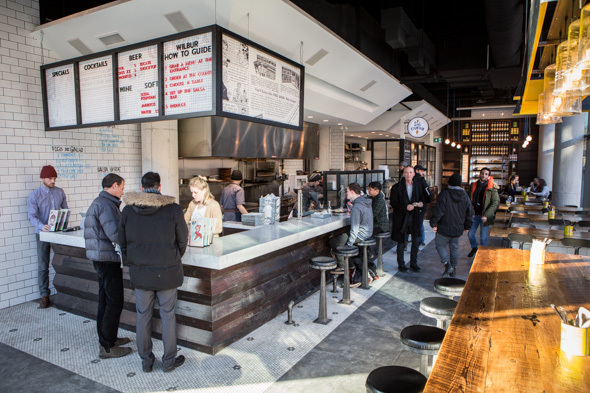 Guests grab a clipboard menu upon entering and walk up to the counter to order; from there, head to the help-yourself selection of salsas and hot sauces before grabbing a seat and waiting for your order to be delivered to the table. 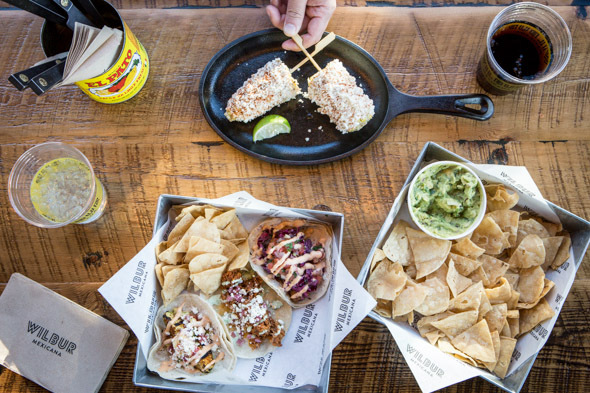 It's a taqueria that makes no claims to Mexican authenticity but is more in line with SoCal taco styles -- plus there's a few unexpected offerings, like a bulgogi beef taco. I tried the Mexican corn, guac and chips and an array of tacos. 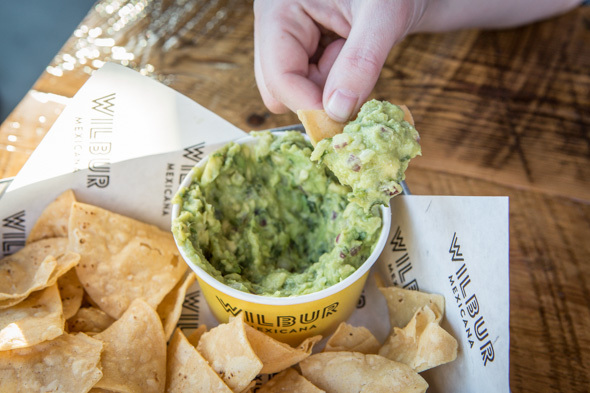 The guacamole ($4.50) is great and easily shareable. There's no evident filler, just mashed avocados studded with red onion and zippy from lime juice. The tortilla chips are fried on site and their freshness is welcome. 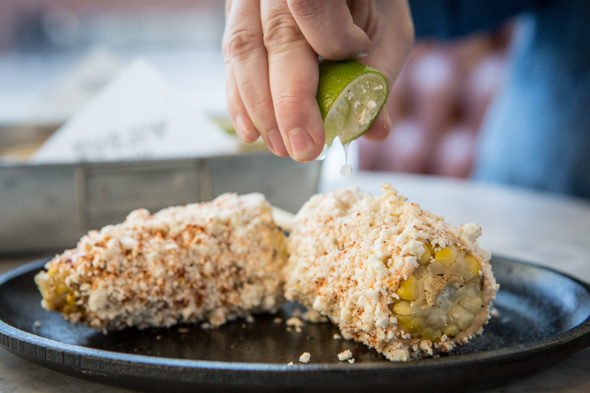 I like the mexican corn ($3.50) too - it's rolled in chipotle crema and cotija cheese then dusted in guajillo and cayenne chili pepper. The list of tacos offers seven variations - each priced at just $3.75, with the exception of the Baja fish, which is $4.25. The golden beer battered mahi mahi, loaded up with crunchy red cabbage, pico de gallo and chipotle crema, turns out to be my favourite, while the pulled pork, carne asada, and grilled avocado are each quite satisfying as well and uniquely dressed with complementary condiments. For a place all about spice, the kitchen isn't really cooking with any. 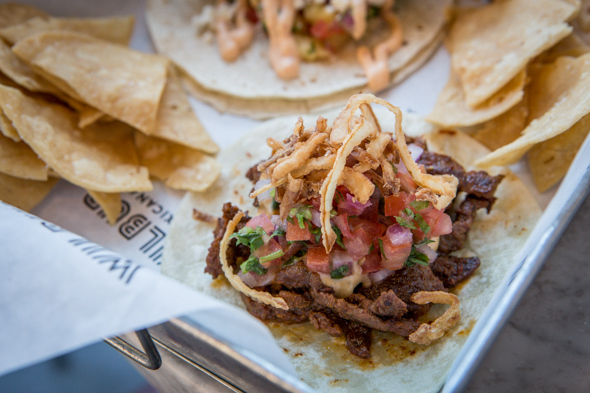 Each taco I tried was flavourful but ultra-mild -- whether your looking for just a little kick or are a thrill-seeker looking to be blown away, expect to rely on that salsa and hot sauce bar to amp up the degree of spiciness per personal preference. 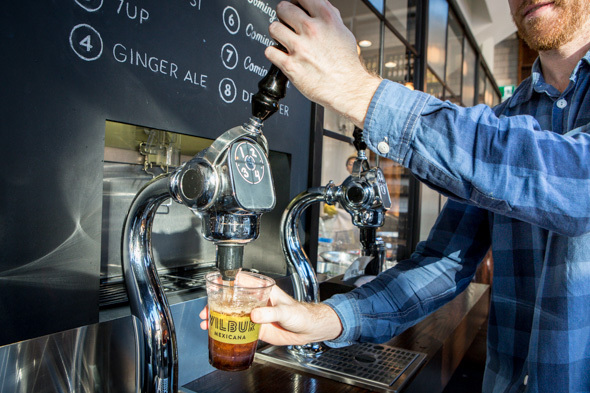 Custom built self-serve soda fountains are currently stocked with Pepsi products, though the intent is to bring in craft sodas from indie vendors. Beers ($5-$6) like Dos Equis and Tecate are already on offer while wines and a cocktail list developed by Elan Marks ( Weslodge ) are set to roll out soon. A King Street-facing patio will seating another 30 in the summer months, and while the kitchen currently closes at 10pm nightly, there's potential for hours to be extended once the cocktail program is launched.